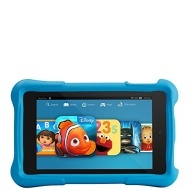 alaTest has collected and analyzed 606 reviews of Amazon Kindle Fire HD 6 inch Kids Edition. The average rating for this product is 4.3/5, compared to an average rating of 4.5/5 for other products in the same category for all reviews. People are impressed by the performance and price. The size and portability are also appreciated, whereas there are some critical opinions about the reliability. If you haven't already handed down your old Amazon tablet to your kids, here's another chance. The kids edition of the Amazon Fire HD tablet is essentially the 2013 model of the Fire HD, but with a few crucial kid-friendly additions. In addition, Amazon announced a refresh to its Kindle Fire HDX 8.9 tablet and a new model of the Kindle Fire HD 7.